Best-selling, award-winning author Cynthia Copeland knows boys and she knows dogs More than a basic manual on housebreaking, feeding, and grooming, A Boy and His Dog offers extra information boys really want, like weird dog facts, pup quizzes, ideas for boy-dog adventures, and ways to test a dog's IQ. From games like "Milk Jug Keep Away" to toys and treats kids can make for their pets, readers will find loads of terrific ideas for having fun with their pups. Those who've wondered whether dogs dream or have a sense of humor, or why they chase cats and roll in gross-smelling stuff, can turn to Chapter 9: "Understanding your dog." Adventurous boys can find out how to teach their dogs to pull carts or sleds or find tips on camping and biking with their dog companions. 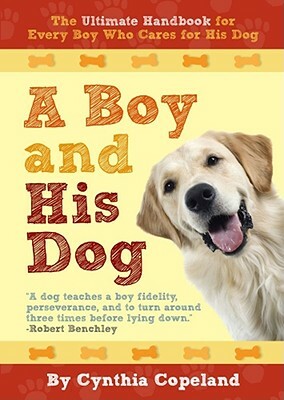 Those who prefer fun to stay closer to home will want to read about the 10 cool movie tricks to teach a dog, or maybe even the top 10 lazy ways to exercise a pooch From the best movies to watch with a dog to the best books for dog-loving boys, this book offers everything a boy needs to know about training and caring for his new pet, and enjoying the experience to the fullest. Jam packed with funny and heart-warming photos, cartoons, and illustrations. Cindy Copeland has written and/or illustrated over 25 books for parents and children. Her most well-known are Really Important Stuff My Kids Have Taught Me, The Diaper Diaries, and Fun on the Run, with a total of over a half million copies in print.